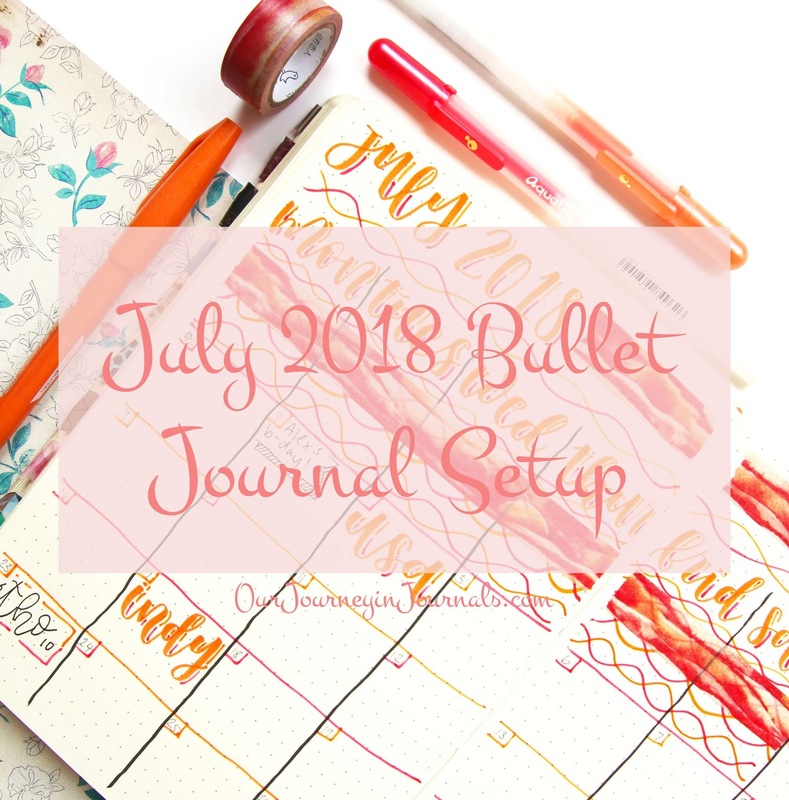 My laptop has been having issues, so I am finally now able to show you guys my July bullet journal setup. I set up and took the pictures before I left for China in the middle of June, but my laptop couldn’t connect to the internet; consequently, I was unable to post this in a timely manner like I planned. I just got back last week, soI’m still recovering from jet-lag. I know it’s near the end of the month, but hey--better late than never! First of all, here is my “completed” June monthly spread. Though this picture was taken mid-June, as stated before, I haven’t really added much at all since then since being on vacation—particularly during summer break—means that I don’t have much to do myself in terms of planning. Here is my July monthly spread. 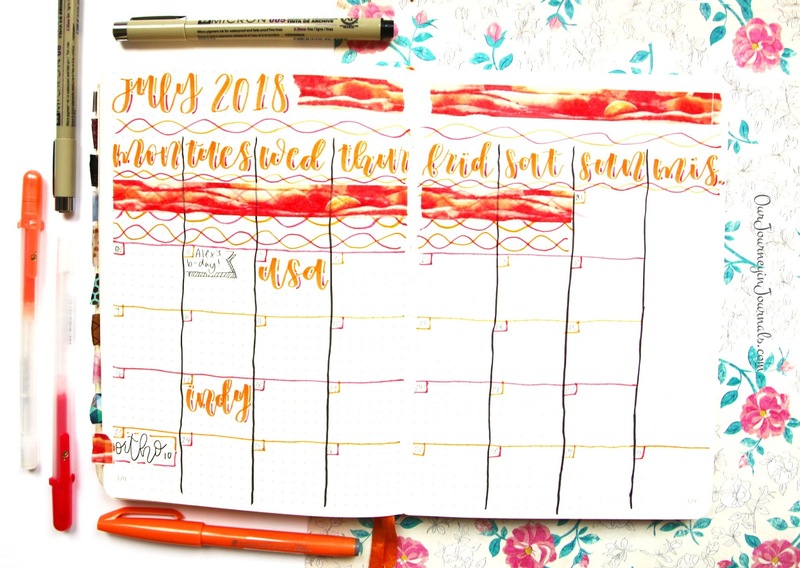 This sunset washi tape I got last year really fits an “in the deep of summer” sort of vibe, so I matched it with an orange Pentel Fude Touch Brush Sign Pen and a red and an orange Sakura Glaze/Aqualip gel pen. 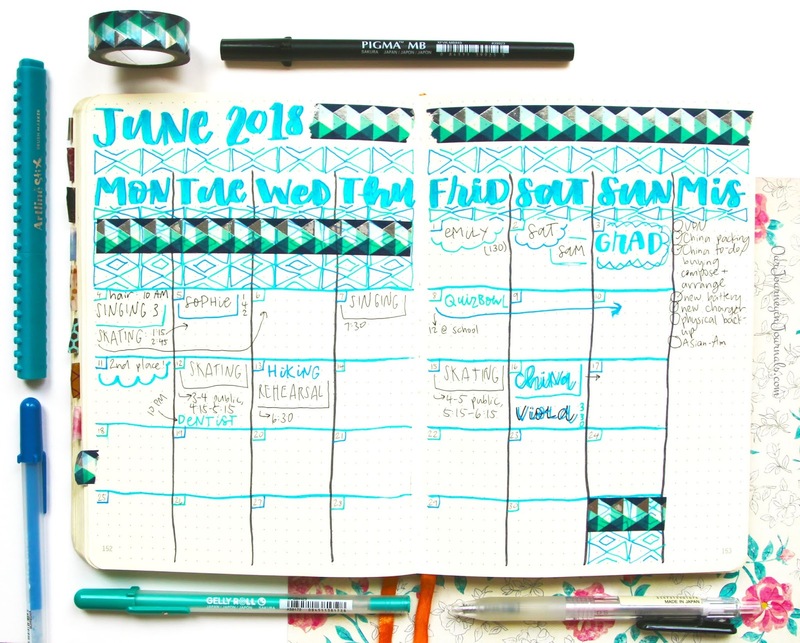 I also used a black Sakura Pigma Micron 005 and a black Sakura Pigma MB Brush Pen to write the calendar dates and the calendar grid, respectively. This is my blank monthly memories spread for July, where I'll hand-letter the big events of July as a fun way of memory-keeping. I always tell myself that I'll do my memories spread within a week of the month ending, but so far this year, I've been badly procrastinating. Though I planned to catch up while in China, I only managed to do three out of the six monthly memory spreads I planned to do (like I said, I've been procrastinating); you'll most likely see them in my next setup post--which will be setting up my fifth bullet journal! I hope you enjoyed seeing my July setup, even if it is almost a month late. Get hype for next week's new bujo setup--which also happens to coincide with the beginning of my last year of high school! 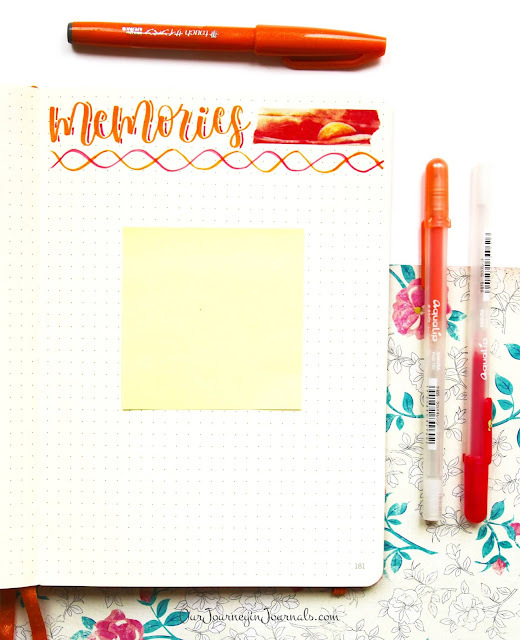 Since this is the end of bullet journal number four for me, I'm curious; what bullet journal number are you on?